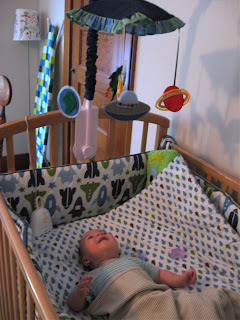 I wanted to share with you some pictures of the mobile we made for Everett before we met him. Like the porcupine costume (pictures in the bird costume post), this was truly a team effort for Brian and me. We decided on shapes and created them together. I did all of the hand sewing, but that was just because I didn't have a machine where we were then, and Brian worked more than I did. My best friend Rachel kindly gave us the mobile her kids used, and we reused all the plastic parts from it. I painted its stars yellow and orange to match the fabric. I also used the original mobile's fabric as sort of a pattern, although I didn't rip it apart. I'm not sure if Everett liked it. Do babies ever really like mobiles? He liked the ceiling fan a lot more! Haha. Oh well. At least Brian and I had fun doing a little nesting in our tiny apartment that didn't have a nursery. And we made something we're proud of and can reminisce about.